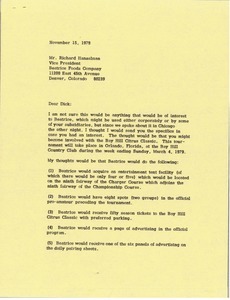 Suggesting Beatrice Foods become involved with the Bay Hill Citrus Classic. McCormack outlines the proposed arrangement including entertainment tents, advertising space, identification on the scoreboard, participation in the pro-amateur, costs, and other details. 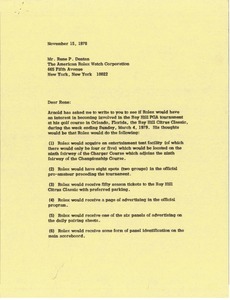 Writing on Arnold Palmer's suggestion regarding Rolex's patronage of the Bay Hill Citrus Classic. McCormack outlines the proposed arrangement including entertainment tents, advertising space, identification on the scoreboard, participation in the pro-amateur, costs, and other details. 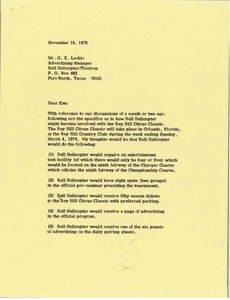 Proposing Bell Helicopter become involved with the Bay Hill Citrus Classic. McCormack outlines the proposed arrangement including entertainment tents, advertising space, identification on the scoreboard, participation in the pro-amateur, costs, and other details. Writing on Arnold Palmer's suggestion regarding patronage of the Bay Hill Citrus Classic. McCormack outlines the proposed arrangement including entertainment tents, advertising space, identification on the scoreboard, participation in the pro-amateur, costs, and other details. 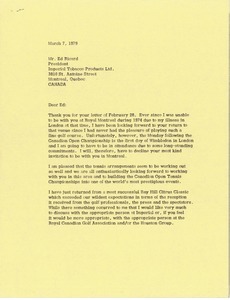 Canada - Declining an invitation to be in Montreal following the Canadian Open Championship due to commitments at the Wimbledon. McCormack is pleased to be working towards a Canadian Open Tennis Championship. In addition, McCormack comments on the success of the Bay Hill Citrus Classic and hopes to discuss customer entertainment tents as a concept for the Canadian Open Tennis Championship. 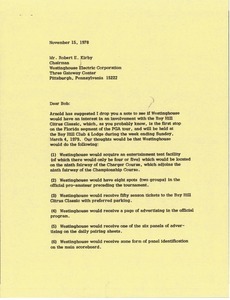 Proposing Esmark enter an arrangement with the Bay Hill Citrus Classic, at Arnold Palmer's Bay Hill golf course. McCormack outlines the proposed arrangement including entertainment tents, advertising space, identification on the scoreboard, participation in the pro-amateur, costs, and other details. 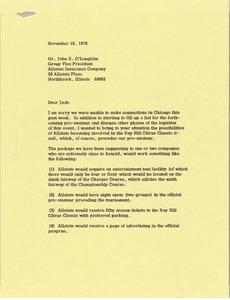 Suggesting Allstate become involved with the Bay Hill Citrus Classic. McCormack outlines the proposed arrangement including entertainment tents, advertising space, identification on the scoreboard, participation in the pro-amateur, costs, and other details. 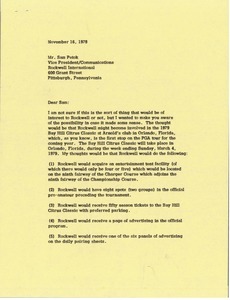 Proposing Rockwell become involved with the Bay Hill Citrus Classic. McCormack outlines the proposed arrangement including entertainment tents, advertising space, identification on the scoreboard, participation in the pro-amateur, costs, and other details. 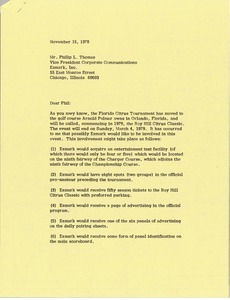 Concerning Trailways' involvement in the Bay Hill Citrus Classic and ski activities and charters. McCormack clarifies that Trailways' arrangement with the Bay Hill Citrus Classic would include identification on transportation to and from the parking facilitates. 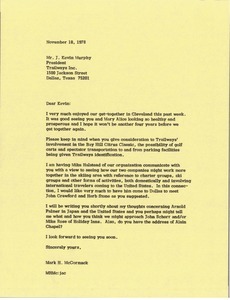 Concerning skiing, McCormack informs Murphy that Mike Halstead will be working on ideas for working together on ski charter groups. 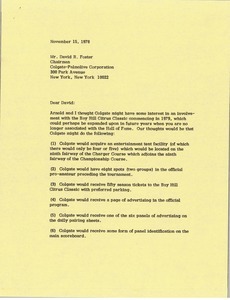 McCormack and Arnold Palmer suggest Colgate enter an arrangement with the Bay Hill Citrus Classic. McCormack outlines the proposed arrangement including entertainment tents, advertising space, identification on the scoreboard, participation in the pro-amateur, costs, and other details.